The Très Riches Heures du Duc de Berry, is often referred to as "le roi des manuscrits enluminés" or "the king of the illuminated manuscripts". A book of prayers to be said at canonical hours was commissioned by Jean, Duc de Berry and was painted by the Limbourg brothers. The Limbourgs have painted the scene in a chapel-like structure, whose slender pillars, blue vaults, and statuettes at either side of the roof. 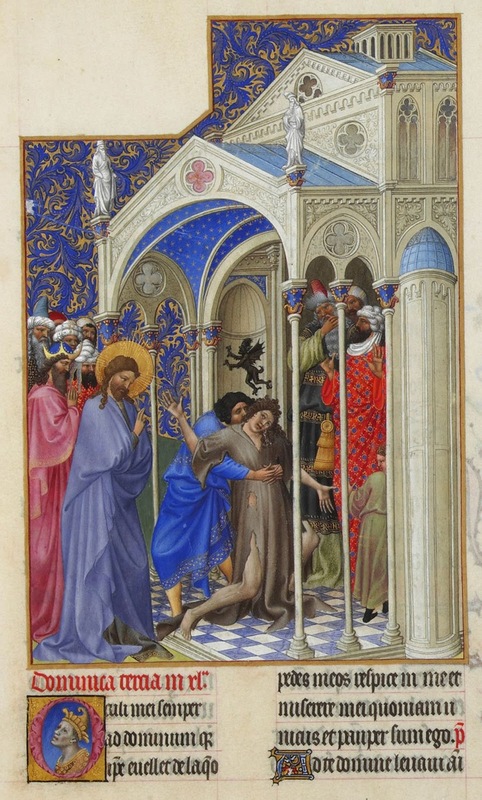 Christ blesses the possessed youth who struggles in his mother's arms, while the demon leaves the boy's head in the form of a small black-winged dragon. Outside and within the chapel groups of figures wearing oriental robes and headdresses express their amazement at the miracle. The sumptuous golden floral work on the blue background surrounds the image. 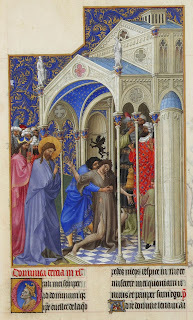 Limbourg Brothers (Dutch, fl. 1385–1416) refers to Paul de Limbourg and his two brothers, Jean and Herman. The three artists had originally worked under the supervision of Berry’s brother, Philippe de Hardi, on the Bible Moralisée and had come to Berry after Hardi’s death. As of 1411, the Limbourgs were permanent members of Berry’s household. It is also suspected that another book of hours, the Belle Heures, completed between 1408 and 1409, can also be attributed to the brothers. It is suggested that the Limbourg contribution to the Très Riches Heures was completed between 1412 and 1416. Documentation from 1416 was found indicating that Jean, followed by Paul and Herman, had died that year.